Hybrid Definition: A hybrid travel trailer is typically defined as a compact trailer that has hard sides with a pop out sleeping area. A hybrid trailer will usually have one or more pop outs that are located in the front, back or side of trailer. 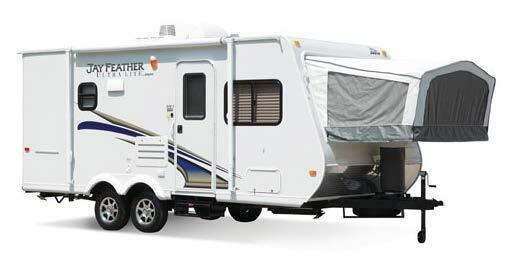 Hybrid travel trailers are different compared to pop-up tent trailers. Pop-up trailers are designed to collapse using some type of electrical motor or manual system. Hybrid pop outs are made of fabric and designed for sleeping only. A Hybrid design can be found in either a light weight travel trailer or an ultra-lite trailer and can be towed by some SUVs or light weight truck. Some of the advantages of a hybrid travel trailer are they do provide more protection from the elements as compared to a pop up tent trailer and weigh less than a conventional travel trailer. 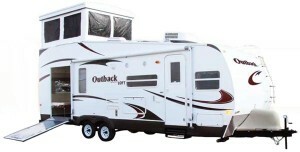 The pop out beds add more sleeping space but without the added weight for towing. Usually consumers who are not quite ready to step up to a larger trailer will enjoy the size and ease of use of a hybrid trailer. For those times you arrive at your campsite and its pouring rain there usually are some sleeping areas inside the trailer such as a couch or table that folds down, without having to stand in the rain to open the pop out sleeping areas. It will be more cramped inside without extending the sleeping areas but in a pinch it is nice to have this option. The pop out tents can hold condensation and there is no insulation so they can be on the cold side when sleeping in cooler climates. To help with condensation you can leave a window open for air flow and this usually helps. They are also not allowed in some campgrounds that have bear problems so keep this in mind when shopping for a hybrid travel trailer. On the positive side there are no mechanical parts to opening the tents. You just need one person inside and another on the outside and out pops your sleeping area. For those of you who like the feel of the great outdoors while sleeping then this type of trailer may be just the RV for you. We do not rate pop-up trailer manufacturers in this comparison guide.